Clubfoot is one of the most common congenital anomalies of the lower extremity and one of the most common congenital anomalies at all. It can be found approxim ately in one of one thousand newborns (and it is more frequent in males than in females). Clubfoot is a severe anomaly and may affect the future ability of normal walking, when it is not properly treated. The deformity itself is very complex and it is caused by an abnormal prenatal development of the feet that result in an abnormal structure and position of several bones and joints. Therefore the therapy of this anomaly can be problematic (and long lasting) and often requires surgery as the final treatment method (when the rehabilitation and bandage therapy are unsuccessful). Despite the relatively commonness of this anomaly, the exact pathogenesis of clubfoot is still unknown and numerous etiologic factors remains hidden. Today we know that some cases (about 25 %) have a positive family history, so there are probably genetic factors involved. 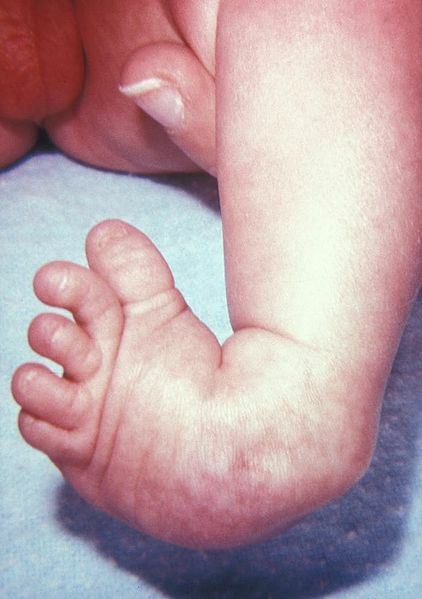 Scientists have identified several genes that are (more or less) associated with the clubfoot. The recent study however shows the possible connection of chromosomal aberration (what is a more complex change of the genetic information than a simple gene mutation) with the clubfoot, what is something new in this field. The scientists at Washington University School of Medicine have published results of their recent study that point to a specific region of the chromosome 17. The researchers have investigated the material from 66 patients with the clubfoot. They have used a chromosomal microarray method, which can provide more detail results than the standard chromosome banding methods used for the classical karyotype examination. And the researchers were successful, when they have discovered structural aberrations in specific region of the chromosome 17 in four patients with the clubfoot.In three cases, they have found small recurrent duplication and in one patient they have found small recurrent deletion of the chromosome 17 region. On the other side, no similar abnormality of chromosome 17 was found among 700 control patients without clubfoot. The researchers further studied the chromosomes of ten family members of the three patients with the duplications on chromosome 17. All family members with the duplication and clubfoot anomaly were males. However, them researchers also found one female family member without clubfoot, but with other common congenital anomaly of the lower extremity - dysplasia of the hip. This is really interesting, because some of the patients with clubfoot also had congenital abnormalities of the hip. 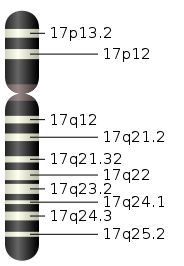 The involved region is situated on the long arm of the chromosome 17 (exact location: 17q23.1q23.2). In this region, there is a gene called TBX4.The team of scientists believes, this gene is associated with PITX1 gene function (5q31). The PITX1 gene itself was discovered by the same team of scientists some time ago as the first gene associated with the congenital clubfoot. It plays an important role in the early stages of development of lower extremities. Now it seems that both genes work together and are involved in the same stage of development. The scientists believe that the results of this study can improve the diagnostics of the inherited clubfoot. The identification of the chromosome 17 abnormalities can be performed both prenatally and postnatally. However, the etiology of the clubfoot anomaly is very complex and not all cases of the inherited clubfoot can be identified with such screening. The scientists therefore proclaim to continue with this research in order to identify other possibly involved factors.